Prison crime rate: The U.S. violent crime rate is falling partly because the Justice Department ignores the countless crimes that take place in prisons. The statistical sleight of hand that makes the U.S. crime rate seem lower than it really is. Imagine an American city with 2.2 million people, making it the fourth largest in the nation behind New York, Los Angeles, and Chicago. Now imagine that city is a place where residents suffer routine violence and cruelty at rates unlike anywhere else in the country, where they are raped and beaten with alarming frequency by their neighbors and even the city officials who are paid to keep them safe. Now imagine that we, as a nation, didn’t consider the vast majority of that violence to be criminal or even worth recording. That is, in effect, the state of the U.S. correctional system today. Each year, the federal government releases two major snapshots of crime in America: The Uniform Crime Reports, written by the FBI, and the National Crime Victimization Survey, compiled by the Bureau of Justice Statistics. As part of the former, the FBI tallies a year’s worth of crime as reported by police departments around the country. The latter estimates the same by surveying a sample of the American public. The two reports provide the best available data on crime in America and together are used as something of a proxy for how successful our justice system is at curbing crime around the country. According to both, America has become significantly safer over the past two decades, with today’s violent crime rate nearly half of what it was at the start of the 1990s. 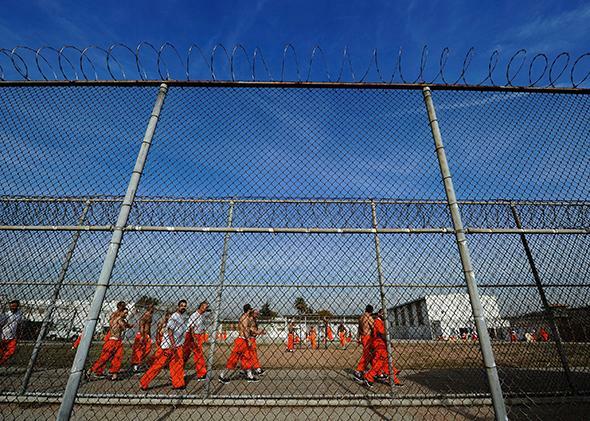 Neither report, however, takes into account what happens inside U.S. prisons, where countless crimes go unreported and the relatively few that are recorded end up largely ignored. If we had a clearer sense of what happens behind bars, we’d likely see that we are reducing our violent crime rate, at least in part, with a statistical sleight of hand—by redefining what crime is and shifting where it happens. “The violence is still there,” says Lovisa Stannow, the executive director of Just Detention International, a human rights organization dedicated to ending sexual abuse and violence in prisons and jails. “It’s just been moved from our communities to our jails and prisons where it’s much more hidden.” It counts as an assault when one drug dealer beats up a second on the streets of Chicago, why shouldn’t it count as sexual assault when one of them is raped after he is sent to prison? It is a crime when someone beats his wife, so why shouldn’t it be a crime when that same person attacks a prison guard? Technically, of course, they are crimes—only the likelihood that someone will be investigated, charged, and prosecuted for them are vanishingly small. Indeed, the assault—especially if it’s between inmates—is likely to never be officially noted. The Department of Justice chooses to exclude the bulk of violence committed inside its correctional facilities from the national crime surveys. These wholesale omissions make it impossible to paint a complete picture of life behind bars in America, but there are nonetheless bits and pieces of the puzzle that we can pull together from what little is available. The FBI, for example, counts aggravated assaults, while the Bureau of Prisons tracks inmate violations for assault on fellow prisoners and guards. The BJS self-reported survey lumps rapes and sexual assaults together, but the National Inmate Survey uses a “sexual victimization” catchall. What might get you arrested outside of prison won’t necessarily earn you a violation inside one, and vice versa. Because as much as we may want to believe that putting more people in prison has made our country a less violent one, the numbers we have suggest that that violence itself doesn’t disappear, it is simply relegated to a place the public can barely see. Regardless of whether you believe that’s a fair trade-off, it stands to reason that the brutality occurring behind bars deserves a fuller accounting—particularly given that we know there are innocent men and women serving sentences they don’t deserve. So, again, imagine this correctional metropolis, and those to whom it is home. First the good news, which may come as a surprise: Someone living there is less likely to be murdered than they would be elsewhere in America. That, however, is where the good news ends. The bad news, of which there is plenty, is that the life he faces is so brutal that he is more likely to commit suicide than if he were free, and his chances of being raped and beaten, possibly repeatedly, appear exponentially greater. All told, there are likely at least hundreds of thousands of violent acts that occur in this city every year that could be counted as a crime if they occurred on the other side of the fence. For comparison, there were 1.2 million violent crimes reported to the FBI by police departments across the country in 2012, and a little more than 5.8 million self-reported by inmates that same year, according to the BJS survey. While rapes have garnered the most attention since the government first began surveying inmates in 2004, it is the near-constant physical abuse—again, at the hands of both inmates and guards—that goes almost entirely unquestioned. The numbers here, too, are imperfect and somewhat dated, but a self-reported survey from 2004 found that 16 percent of state inmates said they had been injured in a fight since they began doing time. Administrative prison records offer another data point: In 2000, inmates were given 52,307 violations for assaulting fellow prisoners or guards, for a rate of 4,260 violations per 100,000 prisoners. Outside prison walls, meanwhile, the FBI tallied 911,706 aggravated assaults that same year, for a rate of 324 for every 100,000 people. The number of people incarcerated in the United States quadrupled during the past four decades before plateauing (and then slightly receding) in the past five years. The inmate population grew so fast during the boom that states were unable to build prisons fast enough to keep up: At last count, more than half of the state prison systems, as well as the federal one, were operating at or above 100-percent capacity. If we choose to continue to lock people up at a rate unparalleled in the world, we should at least be honest and acknowledge that doing so is aimed at eliminating violence from our streets, not necessarily our country.